One from the archives for a little taste of Fall. This picture was originally taken in November 2004 in Maryland. Looking forward to your captions in the comments. Oh my goodness, look at that lil’ pup running with glee….Nothing clever, but Benjamin, you were a heartbreaker from the start!!! Love it! Super Benny to the Rescue!! oh,wait for me please,what a look,oh my such a cutie pie. How an I supposed to find my bone with all these leaves? Dang, I had these leaves in a nice pile, and Henry jumped in the middle of it. Now I have to start all over. Thanks Henry. 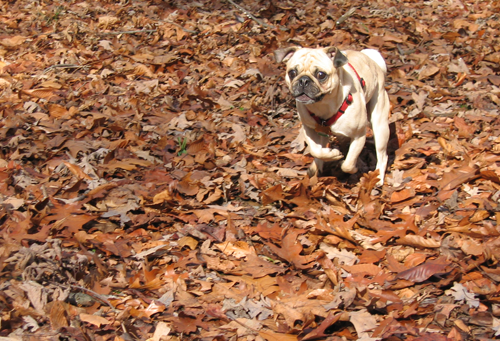 I love running through the rustling leaves. Catch me if you can. Doing Now - see Baby Benny is still off schedule with no dst in sight. Doing Now…Ben and his owner’s manual…Ahahahahaha…too cute! I just know those delicious Maryland crab cakes are around here somewhere! OK, rake these back up and we’ll do it again!